We’ve seen better championship games than UConn vs Butler, that’s for sure. In fact, last year’s Duke vs Butler was much, much better. That said, the overall tournament this year was quite good. It was very entertaining and highly unpredictable this year. Only 2 brackets out 5.9 million plus on ESPN’s NCAA site correctly picked this year’s Final Four (FF). I suspect those two might have pulled team names out of a hat or used some other method of random selection. I can understand how someone might pick UConn and Kentucky to go to the FF, but I don’t see how anyone could have thought Butler and VCU were FF teams. I ended up taking 4th and 5th places, out of 42 brackets, in the pool I was in this year. My picks in the early rounds were pretty good, but I was sunk in end by not picking any of the FF teams. I’m relatively pleased with my performance, given the high number of upsets this year. I was wrong about Butler taking the Final game vs UConn. I noted in my post that UConn was the justifiable favorite, but I thought Butler might have one more upset left in them. I don’t think it was an irrational choice because Butler did beat #1 seed Pitt, #4 Wisconsin and #2 Florida on their way to the FF so they proved they could play with top tier teams. However, they only shot 19% vs UConn and that is what killed them. The poor shooting was due in part to UConn’s great D and in part to the fact that Butler was just ice cold from the outside. The Butler Bulldogs missed a lot of open shots and they had to have to good shooting night in order to have any chance to win. The loss to UConn notwithstanding Butler coach Brad Stevens did a hell of a job just getting team back to the Final Four. I have no doubt that Stevens will ultimately be a candidate for a head coaching job at a school in a major conference. Butler gave him a new 10 year contact last year, but I will be surprised if he lasts until the end. Congrats to UConn and Coach Jim Calhoun for capturing title #3. That is quite an accomplishment for that program. I was happy to see BYU’s Jimmer Fredette win the John R. Wooden award for player of the year. I think he was indeed the best college player this year, but UConn’s Kemba Walker, among others, was a strong rival. Fredette delivered a lot memorable performances this year, esp. against conference rival SDSU. Fredette had a good supporting cast at BYU this year, but he was clearly the star and carried them to the Sweet Sixteen. 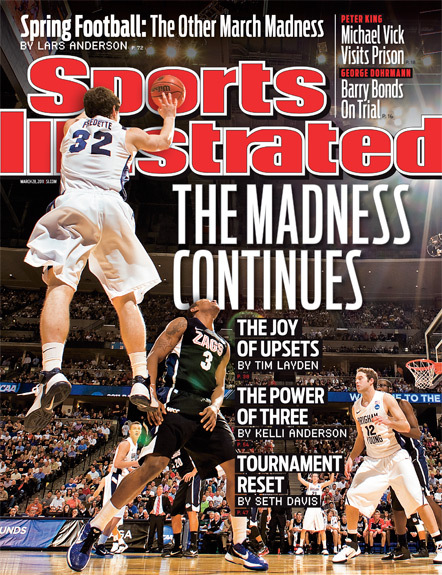 Unfortunately, Jimmer was on the cover of Sports Illustrated mid tourney and of course BYU lost the next game. The SI curse strikes again. You don’t want to be on the cover of SI before a tourney or playoff is completed.